A new ‘magic mastering’ plug‑in from Zynaptiq promises to improve almost any mix, with minimal user input. 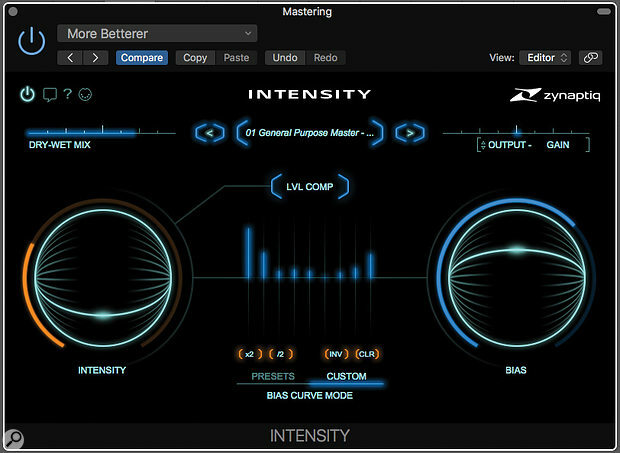 Describing the inner workings of Zynaptiq’s Intensity plug‑in is no easy task, as most of the information available from the developers tells us what it isn’t, rather than what it is. We’re informed that it isn’t a compressor and it isn’t an EQ, even though it takes on tasks that you might otherwise use those tools for. Fortunately, describing what it does on a subjective level is rather more straightforward! In a nutshell, it makes everything sound bigger and better while bringing out detail, all without adding harshness or boominess. The price might look initially a bit steep for something with so few controls, but if you download the demo I don’t think it will take long for you to be convinced that Zynaptiq’s engineers have come up with something rather special. If your client has ever asked you for ‘more of everything’, then this is exactly the plug‑in to fire up. All the usual plug‑in formats (AAX Native, AU, RTAS, VST 2.4 and VST 3, on Mac and Windows) are supported at sample rates up to 192kHz, with authorisation using the iLok system. Zynaptiq do divulge that Intensity employs a process not unlike that used by facial recognition software. Neural network analysis and proprietary input and output transformations are used to separate what Zynaptiq describe as the broad strokes and the detail elements that make up a sound. This allows the details to be boosted while the main body of the sound is left unchanged. Individual tracks and whole mixes can be made to sound more detailed, brighter, more dense, louder or more full‑sounding. 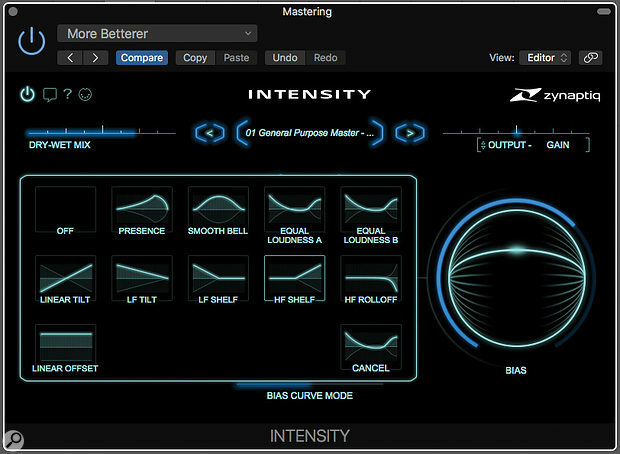 There’s also the option of adding controlled saturation using a soft‑knee saturating limiter at the output for those sounds that need more glue or — at higher levels — aggression, and if you want silky smooth, Intensity can do that too. As with other Zynaptiq plug‑ins, the main controls are large ‘trackball’ affairs, with a curved bar in the middle that acts as a vertical slider and a ring around the edge that functions as an ‘amount’ display. The Intensity control sets the strength of the processing, while the right‑hand trackball lets you add what at first seems like an EQ profile to the processing. In actual fact, however, this is a bias curve, dictating at what frequencies the most processing takes place. You can choose from one of 10 useful presets or set up your own, then use the Bias control to dial in the amount of curve you need. The shape of the Bias curve is shown in the centre, and when you click on Presets you can access the preset high‑lift, low‑lift, tilt and ‘smile’ curves. Click Custom and you can use a set of graphic EQ‑style sliders to shape your own. A Wet/Dry slider at the top left does exactly as it says, while the output slider on the right can be used as a simple gain control or switched to Saturate mode to bring in the soft‑knee saturating limiter. Lvl Comp aims to make the processed output similar in level to the bypassed sound for easier A/B comparisons, though the nature of the processing means that this isn’t always exact, so you may need to tweak the output level by a dB or two to get a good match. As well as the graphically editable Custom Bias curve shown in the main screenshot, you can also pick from a number of preset curves. Control‑wise, that’s all there is to it, but the results that can be achieved really are beyond impressive, both in emphasising detail and in adding loudness without increasing the peak levels too much. The ability to target specific frequency areas using the Bias feature greatly increases the usability of the plug‑in. For correcting mixes that lacked low‑end weight, I found that selecting or creating a suitable Bias curve and then using the Bias control to apply more processing to the lows worked extremely well to redress the balance. Likewise, there are curves that are very effective in increasing the perceived brightness or perceived loudness of a mix or track. If your balance is already OK, then a flat Bias setting works well to deliver that ‘more of everything’ effect, and if you need more of an overall push, the saturating limiter can be driven gently to add more ‘glue’ or be pushed harder to add a more assertive edge — something that might be useful for making a limp snare drum stand out. As this is a soft‑knee stage, the processing starts around 3dB below the mid ‘zero’ position. Applying Intensity to some of my own chill‑out music made little sonic elements really pop out. Everything sounded warmer and more three‑dimensional, with better separation between sounds, and when I bypassed it, the ‘veil of disappointment’ was every bit as dramatic as when switching a really nice stereo mix into mono. Then, a friend sent me a mix of a track he’d produced for a local musician; and although he’d done a really good job on it, his mix was still somewhat lightweight. It took only around five minutes to find settings that gave it the right sense of warmth and enhanced detail, so I tweaked it to give him a ‑15dB LUFS reading, sent it back and he replied saying that it was just what he wanted to hear, but hadn’t been able to achieve using conventional tools. There are some parallels with Sound Theory’s Gullfoss, which also helps lift out detail, but Intensity is one of a kind. Adds space and detail to a mix in a quite dramatic way but without the end result sounding processed. Bias control can be used to fine-tune a mix’s tonal balance without relying on conventional EQ. 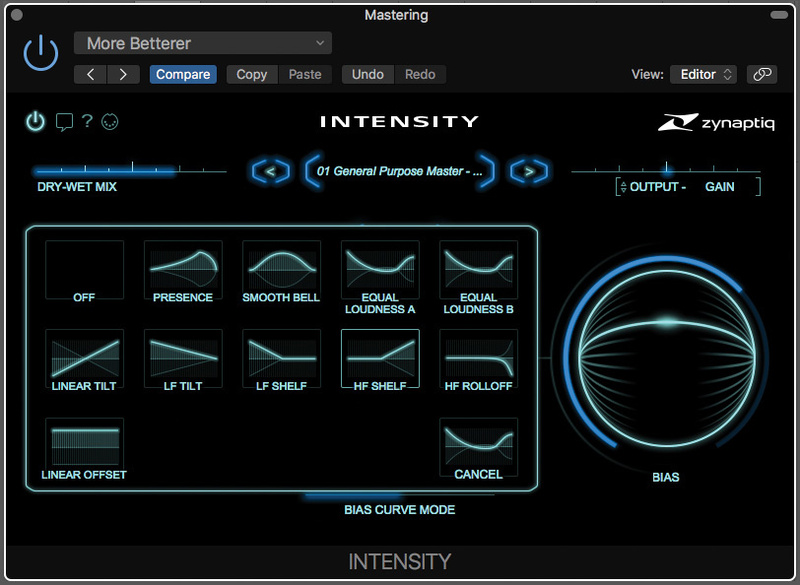 Intensity is the closest thing yet to a ‘make it sound better’ box, and you can learn to use it in 10 minutes. It isn’t cheap, but then neither is what it does.